Toroidal Sudoku, also known as Wraparound Sudoku, is an extra-fiendish version of Jigsaw Sudoku with jigsaw-shaped regions that wrap around the edges of the puzzle, as if it was printed on a toroid. It's also sometimes known as Wraparound Irregular Sudoku or Wraparound Jigdoku. In regular Jigsaw Sudoku the bold-lined rectangles from regular Sudoku are replaced with irregular jigsaw shapes. Toroidal Sudoku keeps these jigsaw shapes but lets them wander off one side of the puzzle and reappear on the other side, making the whole thing much harder to visualise and often resulting in puzzles that are considerably more difficult to solve! Visualising how regions connect, as in the example puzzle below, can be a little confusing. Luckily when you play a toroidal puzzles on puzzlemix each region is shaded a different colour, which helps you keep track of how everything connects. 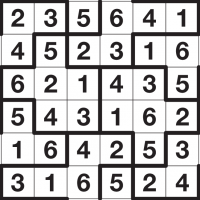 The aim of Toroidal Sudoku is nonetheless essentially simple: place the digits 1 to 9 into the puzzle grid so that each digit occurs once in every row, column and bold-lined wrap-around jigsaw-shaped piece. Bold lines show the borders of each region. Where is no border between a region and the edge of the puzzle, then the region continues in the square at the opposite end of the same row or column. Look at the Toroidal Sudoku 6x6 solved puzzle on the left. The region at the top-left with 234 is the same region as the 165 at the right-hand edge of the second row. The region wraps around the edges of the puzzle. Similarly the 5 on the top row connects to the 42316 region at the bottom-left. Every Toroidal Sudoku puzzle only ever has one possible solution, and it can always be reached via reasonable logical deduction. In other words, guessing is never required. Toroidal Sudoku puzzles on puzzlemix appear at a wide range of sizes and difficulties. Usually they are 6x6, 8x8 or 9x9, although sometimes they are 12x12. In each respective case you must place 1-6, 1-8, 1-9 or 1-12 once each into every row, column and bold-lined jigsaw shape. Why do I use two terms? On puzzlemix I label puzzles which use a 'traditional' toroidal pattern as Toroidal Sudoku, while puzzles that simply wrap around the edges of the grid but use alternative patterns I refer to as Wraparound Sudoku. I also tend to think that Wraparound is a less confusing term than Toroidal! Are you searching for help with Toroidal Sudoku puzzles? Stuck on solving Irregular Sudoku? Don't know the instructions for Toroidal Sudoku? Need Irregular Sudoku instructions? Want solving hints and tips for Toroidal Sudoku? Then puzzlemix is the place for you to play Irregular Sudoku puzzles online. Looking for printed Toroidal Sudoku puzzles? Visit Sudoku Xtra for puzzle magazines and books. Or are you looking for a Toroidal Sudoku puzzle supplier? If so then check out Any Puzzle Media, my puzzle production company.